honey & jam | recipes + photos: Lord, help me! A Portrait of Dashed Dreams. It’s official: Pie Crust and I are mortal enemies. Well never be friends, never understand each other. All of this started rather innocuously. Last night, my mom and I were discussing buttermilk pie. Then I started craving buttermilk pie. Buttermilk pie with flakey, homemade pie crust. Sure, I’d failed in the past, but this time was going to be different. I’d found a recipe that sounded perfect, and got started. It was already 11 at night, so I was going to let it chill overnight and then roll it out this morning and make the pie. I finished up, covered the dough in saran wrap and put it in the fridge. This morning, I let it set out for a while so it wouldn’t be so hard. Then I tried rolling it out. It wouldn’t roll. It seemed like parts of it were too dry and other too wet. It stuck to my rolling pin and wouldn’t hold together. It was hopeless, I threw it in the garbage. I think I need to take a pie crust class. Every single time I’ve tried, I’ve failed miserably. I don’t understand, can anyone tell me what I’m doing wrong? All I want is buttermilk pie! Didn't I tell you last night??? ?You can NEVER go wrong with Philsbury pie crust!!!! Pie crust is one of those things that "you got it, or you don't". Three strikes and I was out, I don't do pie crust! If you get it mastered let me know I may give it another try. I've used the pie crust recipe in the Better Homes and Gardens Cookbook. I don't remember needing to chill it that long and it came out great and flaky. When I got home from work I'll try to remember to send you the recipe. Don't give up hope yet! I had HUGE issues with pie crust until I discovered the recipe from Fine Cooking. I had almost decided to give up and just use Pillsbury every time until I found this one. :) It's actually quite forgiving (I am never one to prepare ice water/keep all my ingredients cold, last time I added too much water and it was all fine, etc.). The only thing is that it's for a 10 inch quiche pan, so it will make more than you need for a standard pie plate--so scale it down or just use the extra for some mini pies. I use the Martha Stewart recipe as well and have not gone back. It has been pretty foolproof for me! The best pie crust I ever used was actually in a better homes and gardens cookbook - I've been making it from scratch since I was like 13. It's a pretty simple recipe - I can try to dig it out for you if you'd like. I'm at home with the Betty Crocker soiled and crumpled cookbook in front of me with the recipe I always use. For the best pie crust, the water has to be ice cold. Fill a glass with ice cubes and water while you get the other ingredients together. Combine these dry ingredients with a fork until the flour, salt and crisco are all combined and the mixture looks like little peas. (You can mix it as much as you need to at this point, but once you add the water, you need to mix it really carefully and as little as possible. Too much mixing after you add water makes tough crust.) Sprinkle 5 tablespoons of the ice water into the dry mixture and stir gently until it holds together. I use my hands at this point instead of just the fork. You may need a little bit more water to get it to hold together so you can roll it out. I wet the counter and put wax paper down on the damp surface so there's less mess to clean up after rolling the crust. Sprinkle flour on the wax paper and put half of the ball of dough on the floured surface. Sprinkle more flour on the ball of dough and roll it out into a circle with a rolling pin. 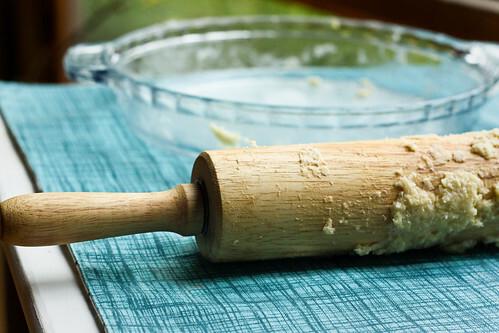 Don't be afraid to add more flour if it sticks to the wax paper or your rolling pin. Roll it out to an inch or so larger around than the pie place. Then fold the dough into half and then fourths so you can easily pick it up and lay it in a pie plate. Unfold it in the pie plate and put it back in a circle with some dough hanging over the edges. Put plastic wrap over the remaining ball of dough so that it doesn't dry out while you make the filling. Peel enough apples to make 8 cups of slices. Put these in a big bowl with three-fourths of a cup of sugar, one-fourth cup of flour, one-half teaspoon of nutmeg, two teaspoons of cinnamon and a dash of sale. Toss all together and dump into the pie plate. Slice two tablespoons of butter and put the slices around on the top of the apples. Roll the second ball of dough out and lay it over the apple mixture. Fold the edges of the top and bottom crusts together and pinch them together so that they are sealed. Stick a fork into the top crust all around the pie so that the filling can vent while it cooks. Bake in 425 degree oven for fifty minutes. I agree with the other's who have stated Martha Stewart as their go to recipe. Please don't give up! You have it in you. I made buttermilk pie for thanksgiving last year and also an apple butter pie. It's worth it to do the crust yourself. Try Martha Stewart! Try this pie crust from Paula Deen. It's for a one crust pie and it's simple; you just have to press it in the pie pan..NO ROLLING! Perfect for a beginner. Cut butter into flour in food processor until texture of very course meal. Add sour cream and process until mixture come together and forms moist clumps. Dough should not be too sticky. Gather dough into a disk and, with lightly floured hands, press dough on the bottom and up the sides of a 9” pie plate. Prick with fork, or use pie weights, and bake in a preheated 375 oven for about 12-15 minutes, until light golden and set. *Note: Pour filling into the hot pre-baked shell, and bake at oven temp directed by the filling recipe. Cover edges if they begin to get too dark. I second the Better Homes and Gardens recipe. I've made it countless times. I have been making it a long time, with advice from my mother, so I'm not sure how making it without that teacher at you elbow would go, but... practice does make perfect. Don't give up! Please! I also have my grandmother's recipe, which tastes amazing and includes an egg and vinegar. It is more difficult to work with, but comes out so nicely. Once you've figured out pie crusts I must share it with you! Your day will come, grasshopper. And you will knock it out of the park!! immediately dismiss any and everyone who tells you to use store-bought. homemade is WAAAAAAYYY better and easy as long as you get the basics. 2. no matter what the recipe calls for, use half butter and half shortening. 3. freeze both fats for 30-45 min. 4. if you have to, freeze both fats thoroughly and then use your cuisinart to pulse them together instead of cutting it by hand. 5. let the dough rest. the longer the better. if you can mix it up and chill it overnight, that's best. 6. when you're rolling it out, throw your dough in the fridge for 10 min ANY time it starts acting up. 7. keep a cookie sheet in the fridge so that you can pull it out and lay it on the dough for a quick chill if you need it. I do not have a specific recipe to give you but I do have a tip! One that saved me from ripping all my hair out. The tip is... Roll your pastry between plastic wrap! It works wonders!!! You don't need to clean your rolling pin after and it's easier to put in your tin with the plastic at the bottom to hold on to! Oh dear... don't be dismayed. You'll get it eventually! I make my pastry in a food processor. It's super fast and mess free. Definitely chill before rolling, and chill well before baking. Refrigerator crust is no where near as good as scratch... it really is easy once you get the hang of it, you'll see. Try a different recipe next time. Have you tried watching some alton brown's good eats episodes on making pie crusts? You can probably search for them on YouTube ... " I Pie" is one of the episodes. He has lots of pie episodes and generally his recipes are pretty good. Martha Stewarts 'Pate Brisee' Crust!! It always turns out perfect! it probably dried out from being in the fridge for so long! try using all shortening first, you don't have to chill shortening crusts at all. and honestly, everyone i've served pie to hasn't noticed that it's not butter. and they love my pie crust! I definitely agree with starting opn an all-shortening crust first... eliminates the need to chill. Morgan's recipe is the one I use and never have problems with. The P. Deen recipe looks interesting but I wouldn't do it for a first-time pie. Good luck! By all means use the food processor (I hope you have one??) Any recipe that asks you to cut shortening into flour it will do perfectly and fast. Chill your shortening and butter, pulse them "until the mixture resembles coarse meal", then add ice water until the dough gathers into a ball. Chill it for at least an hour. Roll it out, put it in the pan, and have your buttermilk pie. Keep trying - don't give up! Someday you will get it right, and you will be so proud! Trust me on this, lard is the key to a good pie crust. Check the nutritional information. Lower in saturated fat and higher in Omega 3 than butter or kernel oils. She has a great recipe for never-fail pie crust, and you will love it! I like the Pillsbury crusts for a pot pie, but you can't go wrong with fresh fruit and the recipe above. Enjoy! I sympathize. Pie crust is a nightmare! Sad. Have faith though - I think you can make a good crust! Buttermilk pie is definitely worth trying again. Practice! Preferably alongside someone who is experienced. You need a great recipe that is simple, and help. Can your mom help you, or will you have to branch out a bit? I learned from my mom. It's one of those things that are better taught than learned from a book. The BEST, and Easiest no fail pie crust is the tart crust from www.davidlebovitz.com a few weeks ago. Just do a search under lemon tart. There is no rolling, refridgeration, and is the flakiest best crust I've ever made. Definitely go with Martha's Pate Brisee, made in a food processor. It's all I ever use, and has never once failed. Good luck and keep trying! I second what Ethel O said, that's the only one I use now. I have never had problems making crust, but this recipe is so easy and quick that I usually make the recipe twice and freeze them so I can pull it out when I want a pie. Don't worry you will get it. I always make sure the butter is really cold. Cut it into chunks, and add it to the bowl with the flour/sugar/salt, etc. Put it into the fridge until everything is chilly. If you use a pastry cutter, refrigerate that, too. Once chilled, rub the butter in and add the water (ice water!!). Chill. Roll. Bake. Serve. This recipe is the only one that works for me, the vodka in it makes the dough wet enough to be able to roll out easily and quickly, and then when the alcohol cooks out, it leaves even more flakiness in the crust. allow me to add another to the pot. i was losing the war with pie crusts, but the tide has turned. seriously, this blog post has photographic instructions on what to do. When you figure it out, pleeeeease tell me your secrets. It's a gamble every time I make those crusts. Honey, one of the all time secrets to rolling out pie crust (even my son can do this) Is to put it on a well floured surface and put a piece of plastic wrap over it and place the rolling pin on the plastic wrap and then roll. Makes it ten times easier. No kidding. Hey, first I have to tell you that I've seen what you can do and I KNOW you can do this. Second, I feel you, it's always a gamble each time I try to make one. Third THANK YOU! After reading everyone's comments to you I'm pretty certain I learned some helpful tips AND lots of recipes to try! pie crust has driven me to tears more than once, and I have tried pretty much everything everyone else has recommended. the thing that finally worked for me was freezing the flour/sugar/salt combo for an hour or two and then just practice, practice, practice. However, I still struggle. I think I will be old and gray before it's ever effortless and it may not even happen then. This posted on Real Baking with Rose. You might enjoy reading what she has to say about this new pie dough mat. Pie Crust was a nemesis of mine for the past 18 months (that's how long I've been baking, before that everything was store bought). Night before last I abandoned my preconceived notions and decided to go for it with a new recipe that swore the secret was lard. Yes, that's what I said... lard. I baked it up last night and oh my word, wowsa! Amazingly good. I do believe pie crust is a LOT about technique and you may have to try it several times before you really have it down pat but don't give up!!! - Shortening! I use it, love it, turns out perfect every time and doesn't need to be chilled. That alone is enough reason to use this particular fat. - Water: the recipe I use calls for about 5 tbsp of water, sprinkled until the dough is wet enough to start to gather. Always use cold water, and don't be limited by the number of tablespoons. I sprinkle 3 of them in and then use from 4 to 6, depending on how the dough responds. Humidity, temperature, ingredients, all factors effect how many tablespoons you'll wind up using until it juuust starts to stick. - Don't touch the dough! Well, touch it as little as possible. When forming the dough into a ball, I use one hand and the sides of the bowl to minimize contact. I remember Alton Brown's pie crust episode, where he gets into the scientific reasons for this, but it's just always been a golden rule in my house. So these tips, plus all the others from your readers, plus LOTS of practice. Best of luck!! Cut shortening into flour and salt with pastry cutter. Mix milk and vinegar together and pour into flour/shortening mixture. Stir until combined. Place ball into waxpaper and let sit in fridge for 15 minutes before using. Roll out with additional flour. Can freeze or keep in fridge for a month. Can re-rollout numerous times without ruining consistency. Always makes a perfectly flaky crust. If you want to accelerate your educational process, get a fast degree online which is the best solution.